On the occasion of Baselworld 2015, Chopard Happy Sport Medium Automatic iconic line presents a new creation combining steel and rose gold within the contemporary and technical watch housing a self-winding movement. 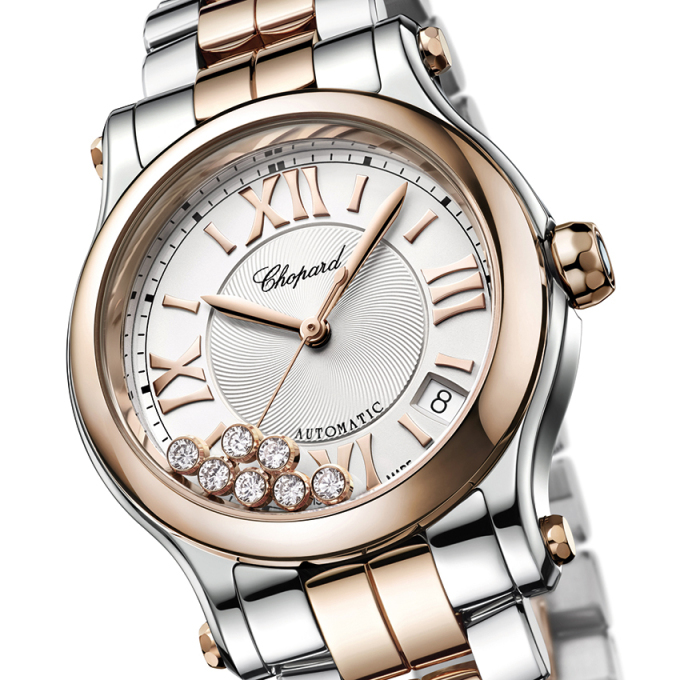 In 2013, to celebrate its 20th anniversary, Chopard unveiled the new Happy Sport Medium Automatic. The famous moving diamonds – one of the most fascinating jewellery innovations in recent decades – added an unprecedented mechanical dimension to their entrancing natural charm. Today, Chopard provides a new two-tone backdrop for this self-winding movement. The Happy Sport Medium Automatic features a case and bracelet in steel and 18-carat rose gold, framing a dainty silver-toned dial with a central guilloche motif, a tribute to the decorative traditions of classical watchmaking and a perfect backdrop to highlight the seven “happily” moving diamonds. Post by Claudia Carletti, Jewellery Through Time. Material courtesy of Chopard Press Office.